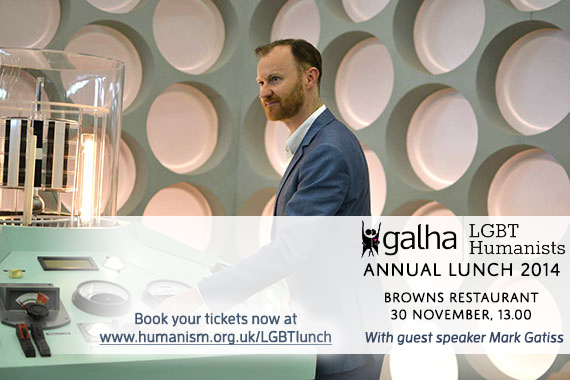 The celebrated actor and writer Mark Gatiss will be the special guest speaker at an event in London on 30th November celebrating Galha LGBT Humanists, a network for lesbian, gay, bisexual, and transgender humanists. Gatiss, is well known for writing for and acting in programmes like Doctor Who, Sherlock, and The League of Gentlemen, and is a firm favourite on both sides of the Atlantic, appearing in fan-pleasing recurring roles in shows like Game of Thrones and Being Human. Mark has been a firm supporter of campaigns for LGBT rights, as well as humanist activism, over many years. At the Galha Annual Lunch, he will be talking with guests about his commitment to these issues, and toasting to another successful year for Galha, which brings together LGBT people for special events and promotes equality and diversity, particularly in respect of sexual orientation and identity matters. The lunch, which will be at Browns Covent Garden in central London, will see Mark honoured with the 2014 LGBT Humanists award, and will also feature a fundraising raffle. All profits will go directly to funding Galha’s activities. "Mark is a fantastic actor and writer, and we couldn’t be more pleased to have him as the guest of honour at this year’s Annual Lunch. The Annual Lunch is always one of Galha’s most popular events, and this year is shaping up to be a very special occasion. Any fans of Mark ’s who are curious about what we do and would like to come along are more than welcome to join us at Browns on 30th November." + Tickets for the event are on sale now at: www.humanism.org.uk/LGBTlunch.